The Yakuza series will see another release next year on the PlayStation 3 with Yakuza: Dead Souls, a zombified spinoff in which four of the series' characters face off against endless hordes of the undead. Sega is very excited with what they have in Dead Souls, and after experiencing it myself, I can't say that I blame them. Honestly, zombies in Tokyo? Does that not sound like the formula for success? Things kick off with a brief tutorial sequence, where players learn how to shoot, kick, and utilize the surrounding objects for deadly melee attacks. Odds are that those familiar with the series will know what to expect when it comes to Yakuza's combat. 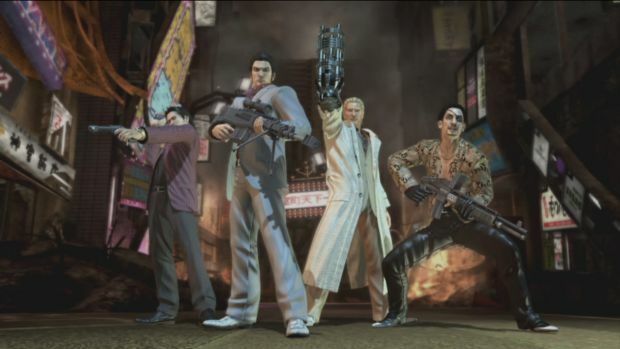 Each of the four characters in Yakuza: Dead Souls has his own unique default weapon -- dual pistols, a sniper rifle, shotgun, and an arm-attached mini-gun. Although these weapons have unlimited ammo, other weapons can be found throughout the town during the course of the game. These alternatives are ideal for certain situations, assuring that the zombie killing won't get repetitive over time. The scenery is unarguably unlike any environment I've seen in prior zombie shooters. Japan is a beautiful city, and here it looks like its been through hell and back. You know, as if there actually were a zombie outbreak? Skyscrapers are crumbling, fires are blazing every which way, and debris is flying through the sky. Sega did a fantastic job capturing the atmosphere of a zombocalypse, and fans of such games will love Sega's attention to detail. Often times, you'll find yourself fighting off a mob of zombies -- rest assured that these aren't the cliche type that stand aimlessly, waiting to be killed. 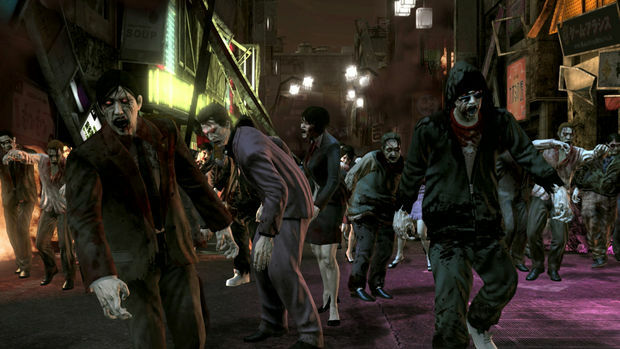 The zombies in Dead Souls run, leap, and fall on you, so you need to always be on your toes. And yes, I did say "fall on you," as in suddenly, one can appear falling from an above building or fire escape. 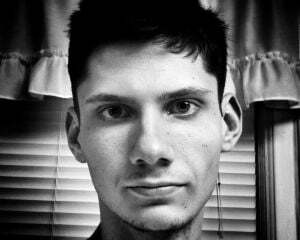 Fortunately, the gunplay appeared to be rather fluid and responsive, with players having the ability either to barrel down a street with guns blazing or to stand still for a second to pick off each victim with precision. Those who choose the precision style of shooting will be greatly rewarded, as headshots end in a fountain of blood erupting from the neck. 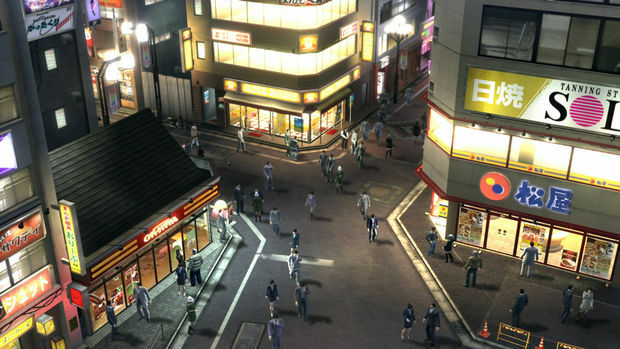 Areas flow nicely in Yakuza: Dead Souls -- one minute, you are in wide-open city streets, and soon after, your back is against the wall and you have to rely on your wits to survive. Certain areas in the game also feature breakable walls, so a keen eye can help you find hidden passageways. One of the new gameplay elements I was shown was Heat Snipe, a brief quick-time event that has you shooting a certain part of a given environment to produce deadly results. The example demonstrated featured a group of zombies surrounding a car, followed by our character's shooting its gas tank from afar to obliterate a good chunk of the mob. Your Heat Snipe meter fills over time; once initiated, the game switches to a cinematic view as the button prompts appear on-screen. Hitting the buttons correctly will activate whatever Heat Snipe action you were attempting to perform, while missing it will cause nothing to happen, leaving you to take on the zombies alone as your meter fills back up. "Alone" is an appropriate term to describe Yakuza: Dead Souls, as my questioning the game's player count was answered with a disappointing fact: there's no co-operative play. One would think that the four characters on the game's cover would imply there would be co-op, but no, you are going solo in this struggle for survival. Overall, I was rather impressed with what I saw , especially since I'm completely new to the series. I doubt it will be the best zombie shoot-em-up we've ever seen, but the unique spin the genre set in the Yakuza universe will certainly work in its favor as it finds its audience, be they Yakuza fans or not. 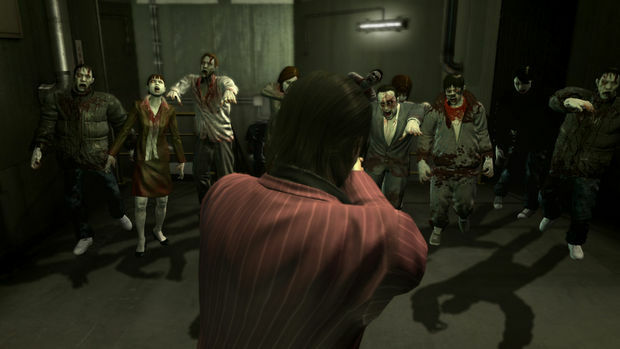 Yakuza: Dead Souls is due out in 2012, and the western release will feature everything the Japanese release does, including its downloadable content.